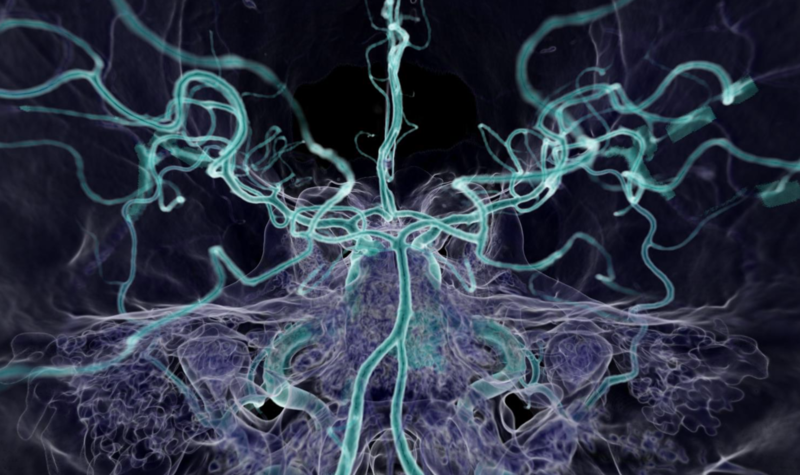 Allows Neuro-Radiologists to perform efficient, accurate measurements of neurology related examinations. 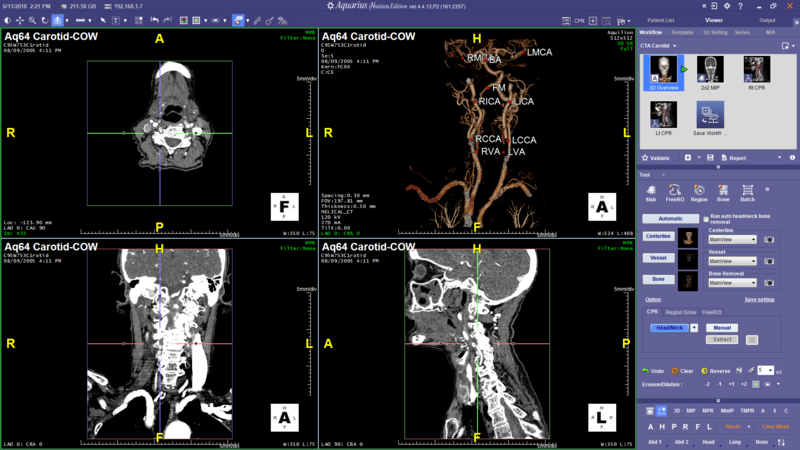 CT Head and Neck Package tools facilitate bone and vessel removal with advanced editing to support vasculature analysis including stenosis ratio, area, diameter, Min, Max, Mean or perimeter cross section display. Radiologists can calculate the volume of organs or regions of interest with histogram output and utilize exportable measurement values for follow-up comparison. It also provides the ability to analyze dynamic data to support the assessment of time-dependent behavior of the image intensity or density of the brain including CBF, CBV, MTT, TTP, TOT, RT, and uptake graph. Data from dual source scans are also supported to provide dynamic blending which improves signal-to-noise ratios and subtract high density structures such as bone and metal. Image fusion for cross planar image synchronization with customizable vendor specific map type color scales are also supported. TeraRecon iNtuition Solution Clinical Packages include iNtuition and AquariusAPS. The advanced Head and Neck tool is able to create centerlines, extract and label vessels, and remove bone from the 3D viewer. These steps can be executed quickly and automatically with the APS or manually by following the simple button prompts in the tools panel. Easy to access tools for modifying your selection are placed within the tool panel below the Head and Neck tool so that there is not a need to switch between the tools themselves. Select a Head and Neck study from the patient list. Load selected study into a carotid workflow. Click the "Automatic" button to have the APS easily acquire all the necessary data. Select options for more control over processing when running with "Automatic". Editing tools are also easily accessible from the tool panel. Customize your workflow by dragging in the appropriate tools. The advanced Head and Neck tool is able to create centerlines, extract and label vessels, and remove bone from the 3D viewer. These steps, or user defined rules, can be executed quickly and automatically with the APS or manually by following the simple button prompts in the tools panel. Easy to access tools for modifying your selection are placed within the tool panel below the Head and Neck tool so that there is not a need to switch between the tools themselves. Click centerline to begin centerline extraction. Click to display vessel labels. Click "Vessel" to begin Vessel extraction from previously extracted centerlines. Click the "Bone" button to remove the head and neck bones. Validate this workflow element to save the state as well as secondary screen captures. Click to Generate a generic report with your secondary screen captures and any measurements.